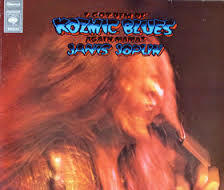 December 10 – Tuesday – Janis Joplin – I Got Dem Ol’ Kozmic Blues Again Mama! Oh Lord – this Voice! Again, I resented my brother for taking Cheap Thrills when Janis was with Big Brother and the Holding Company, and leaving me with this, even though Cheap Thrills was his album. But now, who cares. Janis Joplin could sing anything and it would exude some sort of emotion, whether she’s belting out “Maybe” or bopping to “As Good As You’ve Been in this World.” But “Little Girl Blue” is a killer. If you have ever been unhappy, and you don’t cry when you hear it – well, I would be concerned about you. I put it on twice – cried both times. I’m not bragging. It’s just a fact. And really, not a bad workout album. I can see myself exercising to this again, if only just to hear her voice, and the way she sings, sorry, sang.